The presidential campaign trail has been jam-packed with town-hall meetings and nationally televised debates. But the true test for the Republican presidential candidates won't take place on a stage in front of a studio audience. It will be in and around the country's mom-and-pop shops, which have long served as community forums. Although there may be raised voices and some hijinks, playing host to the presidential hopefuls is usually a source of pride for business owners. It also can be lucrative in terms of media exposure and added sales. During the 2008 election, for instance, the influx of visitors to Iowa added $100 million to the state economy, according to the Greater Des Moines Convention and Visitors Bureau. Dave Panther isn't a political junkie. But he did launch a coffee-bean caucus -- where customers cast their votes for candidates with coffee beans -- at the Hamburg Inn No. 2, just in time for the 2004 caucuses, pitting John Kerry, John Edwards and Howard Dean against each other. The media savvy Panther sent out a press release, and a TV station in Des Moines reported on the story. 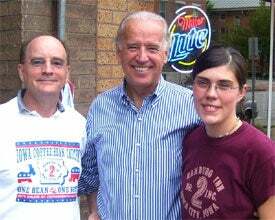 Hamburg Inn owner Dave Panther (left), Joe Biden and the restaurant's general manager. The Hamburg Inn has played host to a cast of political characters -- both real and fictional. Among others, former Presidents Ronald Reagan and Bill Clinton and President Barack Obama have all visited the burger joint. Actor Martin Sheen even stopped by during his stint as the U.S. president on the NBC show The West Wing. "We have made it an attractive place for a grassroots opportunity to meet the voters," says Panther, whose parents opened the restaurant in 1948. The political attention is mostly welcome, as is the media coverage, which Panther says would have cost him hundreds of thousands of dollars. But he concedes that the commotion can hurt business. "Sometimes, when you are having an event, it actually slows things down," says Panther. "For customers that aren't into it that day, they go somewhere else." Most memorable political moment: Just after attending a dedication at the Herbert Hoover Presidential Library and Museum in 1992, former president Reagan stopped by. A week earlier, Panther says, the Secret Service had warned him about the possible visit and told him that Reagan liked meatloaf. "He started his meal with 'Dutch' apple pie," recalls Panther, noting that Reagan's nickname was Dutch. Reagan's table, which Panther quips is along the right-hand side of the restaurant, bears a plaque with his name and the date of his visit. Bill Andreoli knows politicians don't head to MaryAnn's Diner every couple of years simply because they like his company. "It's our clientele," says Andreoli who opened the 1950s and 1960s-themed diner in 1989. "We get blue-collar [workers] and professionals here." The diner's proximity to the Massachusetts border helps. "We're the second town up from across the border. . . When they come into New Hampshire they stop here first." 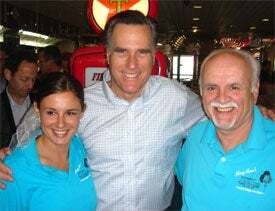 On a recent visit to MaryAnn's Diner in Derry, N.H., Mitt Romney stands with restaurant owner Bill Andreoli and his daughter. MaryAnn's size -- it seats up to 260 people -- also played a role in ensuring its place on the political map. Kerry launched his bid for the presidency in 2004 from MaryAnn's and six satellite trucks piled into the parking lot and at least 50 reporters and camera people jockeyed for position. "That was one of the biggest gigs that came through here," says Andreoli, who is on his third presidential election. Although Andreoli values the exposure, he could skip the media circus. "It can be a fiasco sometimes," he says. "When there are 30 or 40 reporters here, it is a hassle. They overrun the restaurant." Most memorable political moment: Some candidates who stop at MaryAnn's don't eat. Others eat off customers' plates, says Andreoli. When former New York Knick and New Jersey Senator Bill Bradley ran for president in 2000, he visited MaryAnn's with an empty stomach. But after visiting all the customers and snagging their French fries along the way, he told Andreoli he had filled up. Related: Would Studying Politics Help Me in Business? Tommy's Country Ham House has welcomed so many politicians -- from mayors to former presidents -- that many political insiders regard the family-style restaurant as a launch pad to the presidency. South Carolinians have a saying: "The only way to the White House is through the Ham House." 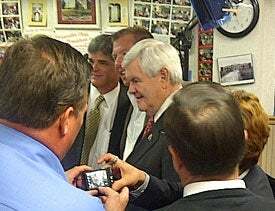 Newt Gingrich, speaking with reporters at Tommy's Ham House in Greenville, S.C. Owner Tommy Stevenson (not pictured) says political visits can be frenzied but offer a welcome business boost. But the 325-seat restaurant fills up quickly, even when the likes of former President George W. Bush and current presidential hopeful Newt Gingrich aren't paying a visit. "We serve a lot of people and the politicians want to come where people are," says owner Tommy Stevenson. But what of his experience whipping up waffles for the presidential hopefuls? "It really helps my business," Stevenson says. "We get other outsiders that come in that don't normally come, and that brings in more business to my restaurant later. . . We see new faces in here every day, after and during the primaries." Most memorable political moment: When George W. Bush visited the Ham House in 2000, animal-rights activists showed up wearing pink pig suits and dumping a truckload of manure in the street in front of the parking lot entrance. "It wasn't funny at the time but funny after you think about it," he says. "They locked the doors to the truck, so all the police could do was watch." When the Versailles Restaurant opened in 1971 in Miami's Little Havana neighborhood, many customers railed against Fidel Castro. The politically charged coffee corner, which since has expanded twice, has retained its vigor. 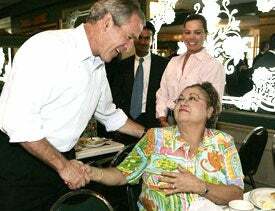 George W. Bush greeting a guest at Miami's Versailles Restaurant. Co-owner Felipe Valls Jr. (not pictured) calls the media attention from being a popular campaign stop priceless. Former Presidents Reagan, Clinton and George W. Bush, along with other politicians, have regarded the Versailles Restaurant as a critical touchstone within the Cuban community. Although Cuban Americans tend to favor conservative candidates, the restaurant itself remains neutral, says Felipe Valls Jr. who co-owns the restaurant with his father. "We don't allow political signs or don't endorse political signs on the property. If they put one up, we take it down immediately." But when it comes to reporters, camera crews and news trucks, Valls' view is the more, the merrier. "I do zero advertising," he says. During a visit to Versailles in November, former presidential candidate Herman Cain asked how to say "delicious" in Cuban instead of Spanish. The media quickly picked up the story. "They spent another three or four days ribbing him about it," Valls says. "You can't put a price on that kind of coverage." Most memorable political moment: In 1977, when Bob Graham was campaigning for governor of Florida, he stopped at Versailles, put on a busboy's uniform and went to work. "He made a lot of headlines," Valls says. "It was funny because customers were surprised that he was working behind the counter when he spoke such good English." For June Joplin, picking her coffee shop's location had more to do with the "energy of the building" than its proximity to the state legislature building, just across the street. But she's been elated by the consequences of that decision ever since. Hillary Clinton with June Joplin, the owner of Comma Coffee in Carson City, Nev. Joplin says the political attention helps her business's bottom line. Since opening Comma Coffee in 2000, not only has she sung to Jimmy Carter, she also has hosted everyone from Hillary Clinton and Barack Obama to Joe Biden and Dennis Kucinich. "It's been fabulous," Joplin says. "It put us on the national and international maps. Every time one of them came here, I would be asked to do radio interviews." She also notes that sales tend to perk up. When Ron Paul stopped by in 2007, about 300 people gathered in her 75-seat shop and overflowed into the business next door. "I definitely notice an increase in sales," she says. "When the president of the U.S. comes in and orders a smoothie, you can't buy that kind of publicity. It's very good for business on all fronts." 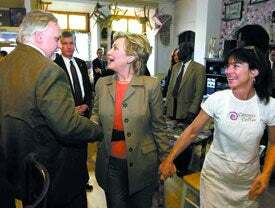 Most memorable political moment: When Hillary Clinton visited the legislature's building in 2007, her assistant came in the shop and asked for tea for his boss. Joplin says she told the assistant: "Tell Hillary to come over and say hi." And she did. "I had 20 minutes to call everyone I knew," Joplin says.